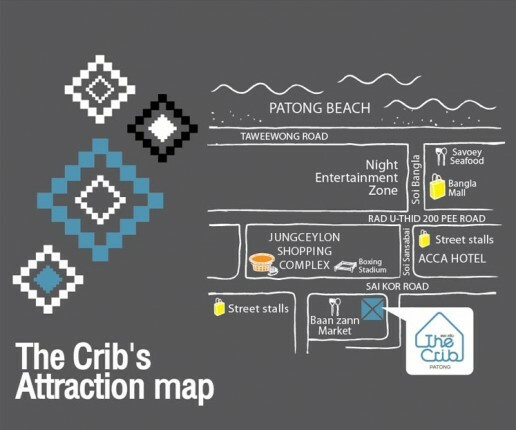 The Crib Patong is on Phang Maung Sai Kor Road, which is closely located to most tourist spots. It is only a blink of an eye walk to Bangla Walking Street that is widely known as one of Phuket most stunning nightlife entertainment area. The Crib Patong is right next to Ban-Zaan fresh market, where you can easily find wide verities of food all day and night. It only takes you across the street to Jungceylon Shopping Mall, the biggest shopping complex in Phuket with over hundreds of Stores and Restaurants. Moreover, in about 10 minutes walking, you can find Patong white sandy beach to enjoy sun, sea, sand, and water sports. Other nearby attractions in the area are including Patong local markets, Thai-Kick Boxing Arena, Red Light District area, coffee shops, seafood and international restaurants, etc.